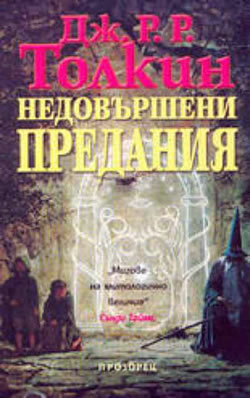 The first book by Tolkien to be published in Bulgaria was “The Hobbit”. 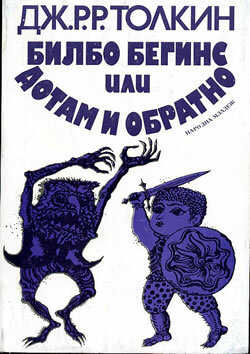 The book entitled “Bilbo Baggins or There and back again” was published in 1979 by Narodna Mladezh publishing house in a stylish black and white soft cover, illustrated by Petar Chuklev. Krassimira Todorova made the translations and the poems were translated by Assen Todorov. 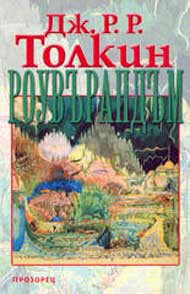 Nine years later (1988) Otechestvo publishing house published “Farmer Giles of Ham” with the original illustrations by Pauline Baynes and translations by Teodora Davidova. And while the first Bulgarian edition of “The Hobbit” can still be found at some second-hand bookshops, “Farmer Giles of Ham” is so rare that is virtually nowhere to be found. 1990 saw the release of the first volume of “The Lord of the Rings”, followed by the second volume the next year. 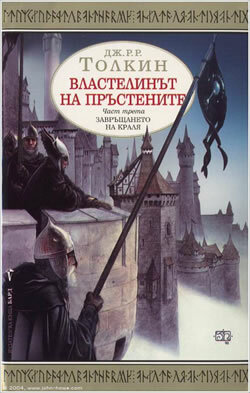 The book was divided into two volumes, the latter being “The Two Towers” and “The Return of the King”. The translations were made by the famous Bulgarian translator and writer Liubomir Nikolov, who from that point was always to be remembered with his work on Tolkien. “The Lord of the Rings” was published by Narodna Kultura publishing house in a beautiful black and white hard cover illustrated by Yassen Panov. The two volumes instantly became must-to-have books in every private book collection. Currently, the second volume can still be found at some shops for rare books at a rather high price. 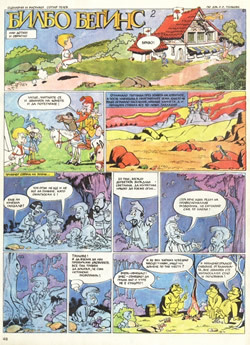 Meanwhile, the popular comics “Daga” began a series of comics on “The Hobbit” and “The Lord of the Rings”, which were the first chance for Bulgarian children to catch a glimpse of the wonderful world of Middle-Earth. Unfortunately, after 1992 the magazine could no longer be financed by the state and the series ended with the end of “The Fellowship of the Ring”. At last, in 1995 Abagar Publishing published “The Silmarillion”, followed by “Unfinished Tales of Númenor and Middle-Earth” in 1996. Once again, the translations were made by the Tolkien expert Liubomir Nikolov, who did a wonderful job with the linguistic challenges set by Tolkien. 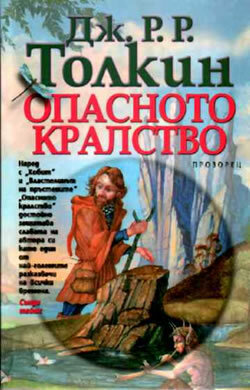 In 1999 BARD Publishing purchased the rights to publish “The Lord of the Rings” using the translations by Liubomir Nikolov. 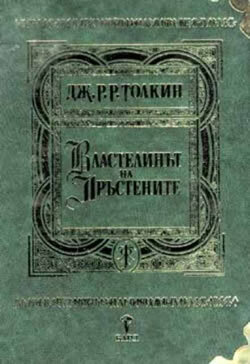 BARD published a one-volume edition of the book without the appendices, followed by another edition this time including the appendices translated by Tsvetelina Krumova. 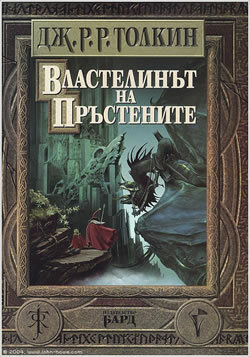 This was also the first time when the appendices were actually published in Bulgaria. The same year BARD also published “The Map of Middle-Earth” by Brian Sibley and John Howe. 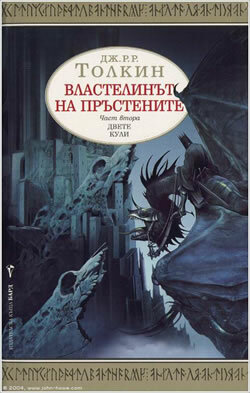 In 2001 Publishing House Prozoretz published the second editions of “The Silmarillion” and “Unfinished Tales of Númenor and Middle-Earth”, as well as “Tales from the Perilous Realm”. 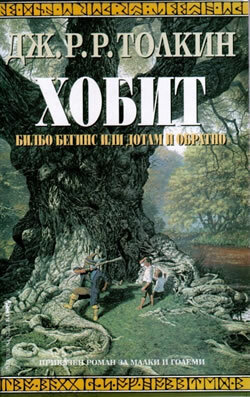 The children’s book included “Farmer Giles of Ham”, “Leaf by Niggle”, “The Adventures of Tom Bombadil” and “The Smith of Wooton Major” with translations made by Nevena Krasteva and edited by Liubomir Nikolov. The same year BARD published “Complete Appendices to The Lord of the Rings” in a separate book for those who had bought the editions without them. The publishing house also released a luxury green-leathered hard cover edition of “The Lord of the Rings”, which can also be purchased in a collector’s wooden box, engraved with runes. On the following year (2002) BARD published a three volume edition box set of “The Lord of the Rings” with soft covers illustrated by John Howe, similar to the Harper Collins editions. 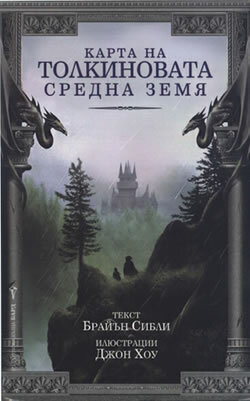 The last book by Tolkien to be published in Bulgaria so far was “Roverandom”. 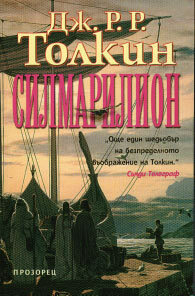 It was published by Prozoretz in 2002 with translations by Nevena Krasteva. Unfortunately, we are yet to see the release of the other works by Tolkien, including “The Letters of J.R.R.Tolkien” and “The History of Middle-Earth”. I have contacted BARD Publishing and learned that they had have talks with Harper Collins publishers but because of the recent increased interest in the works of Tolkien following the success of the movies by New Line Cinema the copyrights have not been obtained due to the very expensive price. 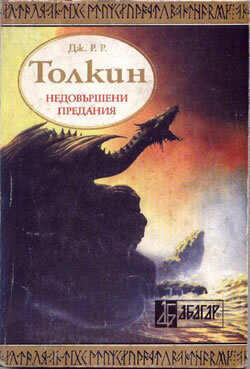 We can only hope that it won’t be long before we are able to read the other excellent works by Tolkien in Bulgarian. 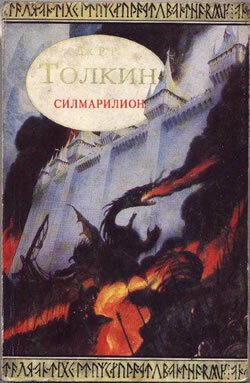 It is strange to see that, even with the enormous succes of the movies, so few Tolkien books got translated into Bulgarian. More countries have the same problem. 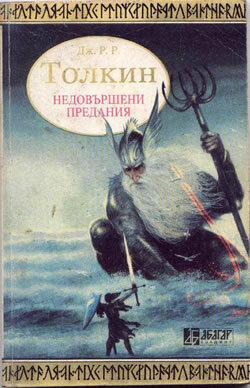 I will not start to analyse whether it is good to translate Tolkien or not. Yet when translated the books can be read by a larger crowd. Once again, when looking at the covers of these translations i see a very nice Hobbit. It is interesting to see the same thing happening worldwide. The Hobbit stays a children book for many and gets very amuzing illustrations, which vary very much from country to country. That is the main reason why it so fun to collect Hobbit translations! All other translation match very closely there English originals. 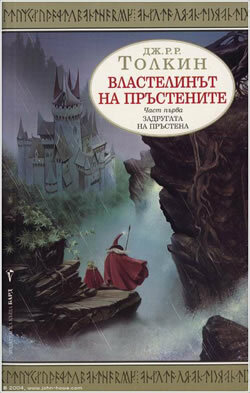 I was very surprised to see the Tolkien comic in Bulgarian. And will try to find out more on this. I'll post a article once i know more! Buying and collecting tranlastions of Tolkien's works is often a very difficult hobby. Tracking them down on ebay is rather difficult, because most of the translations carry strange titles, like fe. The Hobbit, Hobit, Hobito, Hobbin Hobitti, khobit, babo, gnomo, etc. A better solution is buying translations from the Tolkien Shop. Who always has a wide range of Tolkien books up for sale. My solution is yet another one. I make friends, who help me out. Since I live in Belgium i easely am able to track down Dutch copies of Tolkien books. People do the same for me around the globe. 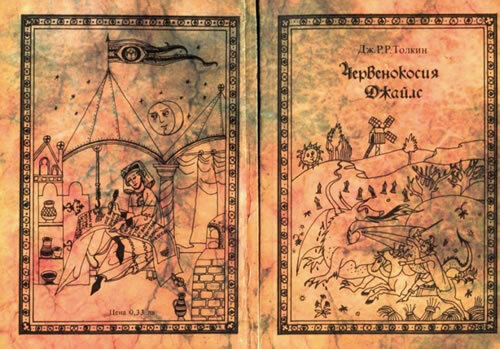 And once in a while someone, like Kaloyan Ivanov, from the website Endorion.org, sends me a nice article which puts together a nice overview of, in this case, Bulgarian Tolkien editions on the market. All articles, essays and reviews are always welcome!